It’s been fifteen months since I last posted anything on this blog. My absence could imply that not much has been happening as far as Govan’s heritage is concerned, or that I’m no longer involved with the projects there, or that my interests have moved on to other things. None of these explanations would be true. In fact, my long silence has been entirely due to having less time for blogging during this period, mainly because I was embroiled in writing a new book. 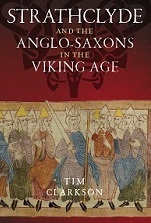 I was also caught up with various other commitments unrelated to history and archaeology. Things are now slowly returning to normal. The new book (Scotland’s Merlin) is finished and published and finally off my plate. I’m starting to squeeze out a bit more time for social media activity (such as blogging and tweeting) and catching up with stuff that has been on the back burner since last summer. The catch-up includes dealing with a backlog of news about Govan, some of which will no longer be news at all. So this blogpost is a quick update to get the rusty wheels at Heart of the Kingdom turning again. What follows is a brief summary of my involvement with events and activities at Govan in the past 12 months or so…. Govan Fair 2015: my article on the theme of “Congregation” for the programme. Friday 5th June 2015 saw me attending the Govan Fair for the first time. It was the third consecutive year I’d written an article for the printed programme, so I felt it was high time I showed my face. The whole thing was fabulous and it was great to meet up with a number of friends I hadn’t seen in a while. In the early evening I joined architect Andrew McAvoy and his family in the circus tent to watch the crowning of the Queen of the Fair. The ceremony was attended by the First Minister of Scotland, the Provost of Glasgow and other dignitaries. Afterwards, the grand parade along the main street was a special highlight – a colourful pageant of floats, bands, dancers and walkers, with the venerable Sheep’s Heid borne aloft at the front. The weather stayed fine and the sunshine held right through to the end. Govan Fair 2015: the coronation ceremony. The Sheep’s Heid leading the parade. My next trip to Govan was in November, when I was invited to give a lecture at the old parish church. 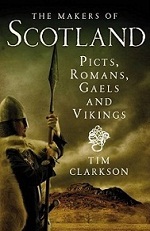 The topic was my book Strathclyde and the Anglo-Saxons in the Viking Age, published in 2014, which deals with the period when the Govan Stones were carved (9th-11th centuries). I was very pleased that the audience was larger than I or the organisers had expected. Many familiar faces were present and it was nice to catch up with them. Also good to meet a lot of interesting new people and make a number of useful contacts. Travelling to Govan means a journey of more than 200 miles so it’s not something I can do on a whim. Hence, I don’t make the trip as often as I’d like, and I usually try to avoid tackling it in the winter. But this year I turned up in the middle of February, to attend another lecture at the church. 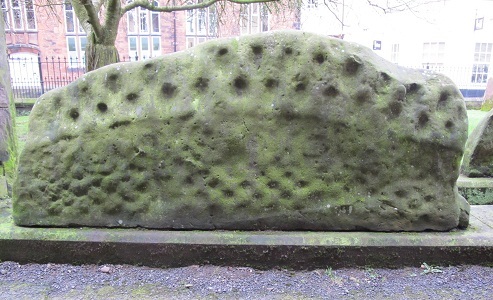 The speaker was Victoria Whitworth, renowned expert on early medieval sculpture, who shared her incisive theory on the origins and purposes of hogback gravestones (five of which stood barely a few feet away). Victoria challenged my own preconceptions and left me thinking that we actually know a lot less about these enigmatic monuments than the old consensus would have us believe. Her suggestion that the distinctive shape represents a human body is certainly persuasive and seems to me to provide a better explanation than ‘Viking house’ or other theories. I’ll end with news of the recent publication of a graphic novel entitled Quest for the Thirteen Treasures of Govan and Glasgow. This has been produced to accompany a heritage trail which includes various places in Govan as well as the Riverside Museum across the Clyde. The storyline follows Merlin the wizard and his mini-dragon companion as they seek the fabled Thirteen Treasures, some of which are cunningly disguised as architectural features in the modern townscape. I blogged about the trail in 2013 when it was in its early stages. A separate blogpost on the graphic novel is in the pipeline but I’ve mentioned it here because it’s another of the projects I’ve been involved with in the past 12 months. And that’s the end of this update, which heralds a long-overdue return to blogging about Govan. On Saturday 19th July I attended a ceremony at Govan Old Parish Church – the grand unveiling of the Weaving Truth With Trust textile screen. I’ve mentioned WTWT in an earlier blogpost and have been following its progress since it started a couple of years ago. The project has involved a number of organisations and individuals who have given various kinds of support but the whole thing has been guided by the creative energies of a four-strong team comprising artists Geraldine Greene, Alexandra Bowie and Fiona Fleming with archaeologist Ingrid Shearer from Northlight Heritage. 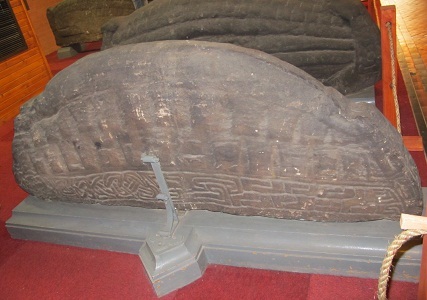 WTWT is closely connected with the Govan Stones project which is working to raise the public profile of the early medieval sculpture housed inside the church. The screen was designed to reflect not only the craftsmanship that produced the stones but also the artistry of later times when Govan had a flourishing textile industry. ‘Weaving Truth With Trust’ was the motto of the Govan Weavers Society, an organisation formed in the eighteenth century to support local handloom weavers and their families. The WTWT screen hangs on a frame fitted to an arched opening inside Govan Old, thus forming a stunning backdrop to the Dark Age hogback stones. Woven from lace, the screen is a delicate, translucent piece of artwork with an almost ethereal aura. It not only compliments the five hogbacks but offers a vivid contrast to their hard, solid presence. Photographs from the event of 19th July can be seen at the WTWT Facebook page. 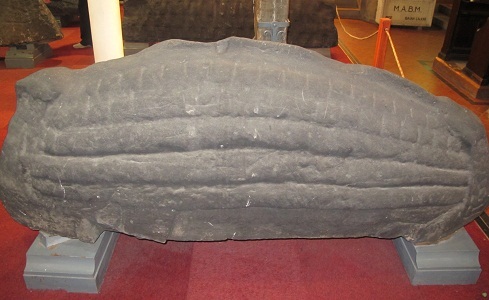 Govan hogback (known as ‘Govan 2’) inside the old parish church. 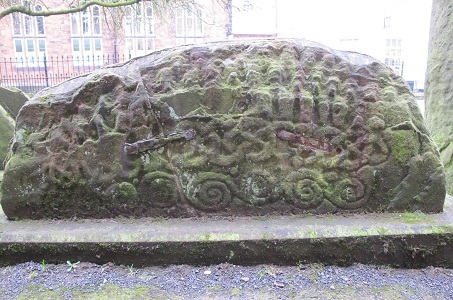 One of the famous Govan hogbacks is going to the British Museum. There it will join other artefacts in an exhibition called Vikings: Life and Legend which runs until June. The loan is temporary, of course, so the stone will eventually come home. No doubt it will attract many admirers during its stay in London, especially among people who have never seen a hogback gravestone before. Although all hogbacks are impressive, those at Govan are truly awesome, being the largest examples of the type. 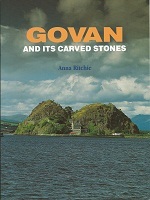 The 400-mile journey is the longest ever undertaken by one of the Govan stones. 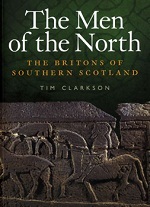 Not since the year 935, when King Owain made a couple of trips to Wessex, has the South of England received such an esteemed visitor from the ancient capital of Strathclyde. A tantalising preview of the re-displayed Govan hogbacks appeared recently on Facebook, courtesy of the Weaving Truth With Trust project. These amazing monuments – shaped like Viking houses – look really impressive in their new positions. The WTWT team is designing a textile screen to hang in the arch behind them. The other stones have also been moved, and their new information boards are almost complete. Soon, the old parish church of Govan (‘Govan Old’) will open its doors to visitors for the summer season. 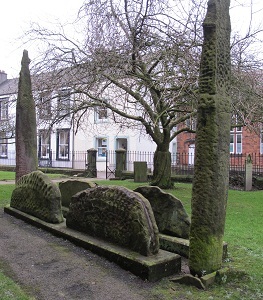 This is the third largest collection of early medieval carved stones in Scotland still in its place of origin. Only St Andrews and Iona have more. So, if you admire the Celtic art of the Picts and Scots but haven’t yet seen the unique sculpture of the Strathclyde Britons, make 2013 the year you visit Govan. More information will be posted here in due course. In the meantime, click the link below to see the hogbacks in their new settings.